It's hard to say exactly why an off-road pick-up needs 575 horsepower, but it's fun when it gets it. Watch the Shelby Raptor tackle Monticello's racetrack and off-road course. Ford makes this truck called the Raptor. It's kind of nuts. For starters, it's a four-wheel-drive Ford F-150 outfitted for serious off-road duty. Then Ford puts in a 411 horsepower 6.2-liter V8. Because, when you're driving off-road, you want go as fast as possible, right? Actually, going fast is usually a bad thing when you're driving over rocks and between trees. The Ford Raptor would be most most at home charging through a flat, wide-open desert. Unfortunately, the closest thing most Americans get to flat, wide open deserts are shopping mall parking lots on Sunday morning and maybe basic cable above channel 100. So, really, this is a truck that makes no sense at all for most rational people. But making sense isn't the point here. Having the biggest, baddest truck is. And once you're in that territory, why stop there? Hey, why not bolt on a supercharger? That's what Shelby American did, after finding out that a lot of Shelby Mustang owners also had a Ford Raptor in the garage. 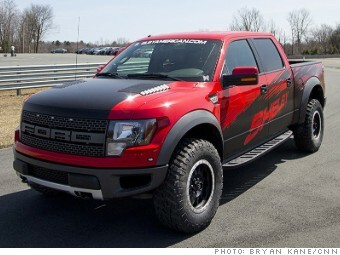 The supercharger pushes the Raptor's engine to a full 575 horsepower. And takes a truck that's already of questionable sanity right over the top.